Netherlands to give monetary incentives to encourage cycling - Welcome to Transport Day Online!!! The Netherlands already has more bikes than people (17 million residents and 23 million bicycles), and the government has announced it wants to get even more cyclists on the roads and it’s willing to pay people to do it. The Dutch government recently announced that it will invest $390 million (€345 million) in cycling infrastructure to get 200,000 more people commuting by bike in three years’ time. According to the Ministry of Infrastructure and Water Management, fifteen routes will be developed into “cyclist freeways” (highways that cater to those on bikes), 25,000 bike parking spaces will be created and more than 60 bike storage facilities will be upgraded,. “My ambition is to ensure that people can easily get to work or school, or visit family and friends,” says Stientje van Veldhoven, state secretary for that department, who is spearheading the project. In 2016, over a quarter of all trips made by Dutch residents were by bike, according to the Netherlands Institute for Transport Policy Analysis. But only 25% of those trips were work-related, compared to 37% which were made for leisure. The rest were for school, shopping, or other activities. 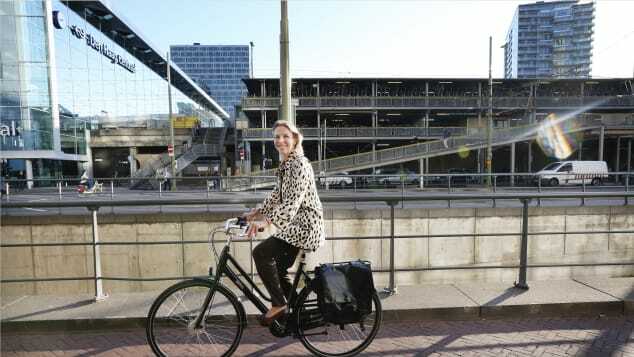 According to van Veldhoven, more than 50% of people in the Netherlands live less than 15 kilometers from work, and more than half of commuters’ car trips are under 7.5 kilometers long — a distance that “can easily be covered by bike,” she says. Stientje van Veldhoven (pictured) commutes by bike, according to the ministry. The Netherlands currently rewards commuting cyclists with tax credits of $0.22 (€0.19) per kilometer. Companies and employees would agree on the distance of a person’s cycling route. However, this is currently a little-known benefit not supported by many employers, according to the infrastructure ministry. That’s something the government is hoping to change by better promoting the scheme and getting more companies on board. There are already 11 major employers in the Netherlands committing to measures such as financing employees’ bikes. The government is urging employers to provide better facilities for commuting cyclists, such as showers at the office, according to the ministry. Today the Netherlands is known for its cycling culture, but that hasn’t always been the case. “In the 1960s and 70s, many Dutch cities were making more space for the car and cycling was at an all-time low,” says Meredith Glaser, a researcher at the Urban Cycling Institute at the University of Amsterdam. “It wasn’t until the late 1980s and early 90s that policies prioritizing cycling and walking were implemented. A “perfect storm of events” led to high cycling rates. Among the contributing factors were the oil crisis of the 1970s, social movements in the 1960s and 1970s against the demolition of neighborhoods for the construction of freeways, and urban density and land uses that encouraged short trips. The Netherlands is now “one of the few countries that takes cycling seriously as a mode of transportation,” adds Glaser. The new cycling freeways include one between Amsterdam and Amstelveen, a suburb of the capital city. Another links the northern university town of Groningen with Assen, a city located in Drenthe, known as the “cycling province” of the Netherlands.